New-built modern house with 4 completely newly furnished apartments is situated in a peaceful and quiet suburb 'Mala Lozna' on the east of Postira. This house is placed with other new houses in a row on privacy and distant from the center approximately 800m, some 10-15 minute of easy walking. Grocery stores, restaurants, post office, hotels and cash-machines are in the center and 800m away from the apartment. The nearest pebble beach Mala Lozna is only 300m away from the house and it is very beautiful and suitable for children and adults. It will take you only 10 minute of easy walking to get there by the road. There is enough place and privacy for resting approximately 300 people either under the shade of pine wood or under the sun. In the small coffee bar situated on the beach you can find cold beverages or ice-creams to cool yourself. 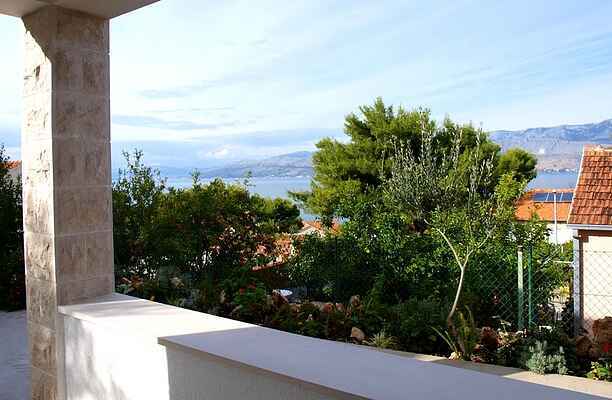 All apartments in the house have their own entrance, their own parking place, view to the clean and clear sea of azure blue and technical equipment necessary for comfortable and pleasant stay including TV, TV satellite, barbecue and swings in front of the house. There is a freezer if one's need it and washing machine on request. For those who like sandy beaches, east of Postira is Lovrecina. Very beautiful beach, 3km away from Postira. It takes only 5 minutes of driving to get there. Due to its shallows, this sandy beach is very suitable for small children and safe for non-swimmers. On the beach is very good restaurant with great gastronomic offers of fish, traditional specialties and well-known high quality wines of Brac. There are also beach volleyball fields. On the south side of the Island Brac is Bol, well-known place to every windsurfer and yachtsman. Swimmers can enjoy on its beautiful beach ''Zlatni Rat''. It will take you only 45 minute of driving to get there..